Looks like a type of Jasmine. Does it have a sweet scent ? If so then I think it's a jasmine. I don't think so - the flowers when they open sort of 'untwirl' on mine. Also the leaves are much glossier. Maybe we need to know if this is actually a houseplant or an outdoors one??? Over to you, Suzie. I'm not sure of the actual name but this looks like a flower used in the floral trade for wedding bouquets called Stephanotis. I think it is used because it looks like traditional orange blossoms but lasts a lot longer. I agree it is Stephanotis ( Brides Breath) I used to use it Wedding Bouquet's when I was in the florist trade. I think you will find it is an indoor plant. 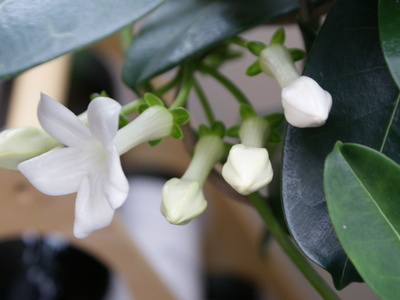 It probably has a strong perfume and it is called Stephanotis.It needs to be trained on a frame or wire of some sort. « This is growing up the side of my lattice, any idea what it is?